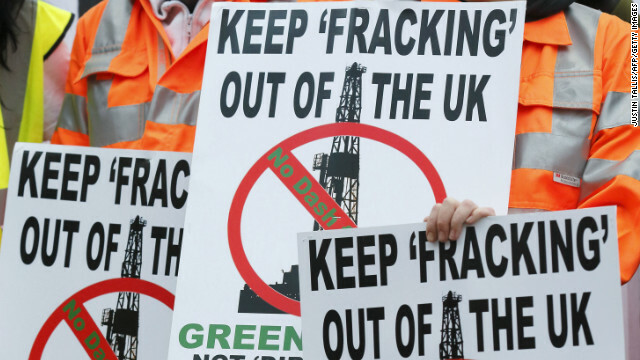 Britain's government lifted its ban on a controversial mining process known as hydraulic fracturing, or fracking, Thursday, allowing companies to continue their exploration of shale gas reserves. Energy Secretary Edward Davey said the decision was subject to new controls to limit the risks of seismic activity. A halt was called to fracking last year after two small earthquakes in Lancashire, northwestern England, where Cuadrilla Resources was exploring for shale gas. The process involves pumping millions of gallons of water and chemicals into shale formations deep beneath the Earth's surface, causing the fracturing of the rock and the release of natural gas.